In these two illustrations we see the convergence of two actual events and personalities in 19th century history. But, before proceeding, it is best to explain that to boost the sale of their products, cigarette companies placed cards in cigarette packs that had pictures of athletes, flags of nations, ships at sea, and famous people - children would pester their parents for the cards and so sales would increase. 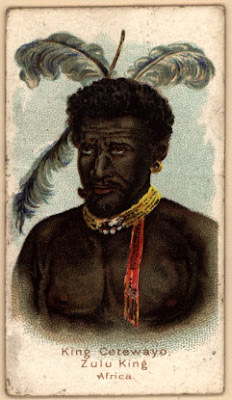 In this case we see the Zulu King Cetewayo pictured on one such cigarette premium card. Cetewayo's army fought the imperialist British army at the battle of Insandlwana in May, 1879. 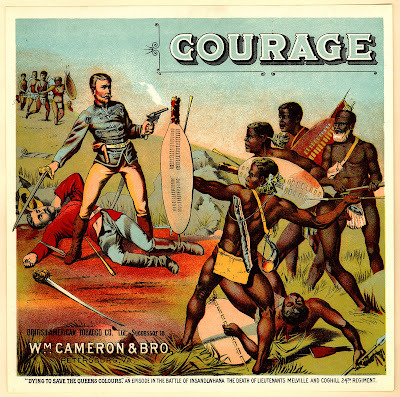 The other image, entitled "courage" shows two British lieutenants, Melville and Coghill, bravely fighting to the Zulus to the end, defending the Queen's colors. At Insandlwana the British were all killed. Such is the price for imperial glory. The Zulus fought the British again at a small outpost, but were repulsed. That is the plot of the movie "Zulu" starring Michael Caine.